Every home has some level of mold. Mold color is not an indication of toxicity. Mold needs 3 things to grow, moisture, air and a food source. Only a certified lab can properly determine what type of mold you have. You should not try to identify mold yourself. This Fungus can be found in water damaged carpets and building materials. It has been reported to be allergenic and its presence is asoiciated with asthma. Some strains are capable of producing a group of myotoxins in the aflatoxin group. The production of toxins is dependent on the substrate and growing conditions. This fungus can be found on air and house dust. Its presence in indoor air often indicates signs of moisture problems in buildings and it is readily found in water damaged building materials. This species produces the mycotoxin sterigmatocystin, which is reported to be carcinogenic to the liver and kidney, and it can cause such symptoms as diarrhea and upset stomach. A. versicolor may be in various colors, as the name implies, and displays great variety in colony pattern and size. This species was one of the first known producers of penicillin. It is found on damp building materials, including paints, chipboards, and wallpaper found often in moist homes. It is an agent of food spoilage as it is in household dust and indoor air. It can also act as a food source for some types of dust mites. P. chrysogenum has been identified as a significant allergen in the indoor environment and as a rare causative agent of opportunistic human mycosis. Penicillium chrysogenum is often found growing as a dark green colony and can produce mycotoxins. Stachybotrys is commonly found in sub-tropical to tropical areas in soil and decaying plant materials, and is considered a type I & III allergen. Considerable recent media attention has been focused on the fungi Stachybotrys chartarum (atra) due to infant deaths in Cleveland from pulmonary hemosiderosis, which may be associated with contamination of residences with this fungus. Stachybotrys thrives on water damaged cellulose rich materials such as sheet rock, paper, ceiling tiles, cellulose containing insulation backing and wallpaper. 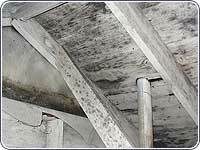 The presence of this fungus in buildings is significant because of the mold’s ability to produce mycotoxins. Exposure to these toxins can occur through inhalation, ingestion or dermal exposure. Symptoms include dermatitis, cough, rhinitis, nose bleeds, a burning sensation in the mouth and nasal passage, cold and flu symptoms, headache, general malaise, and fever. Inhalation of conidia may also induce pathological changes (pneumomycotoxicoses). . Stachybotrys typically appears as a sooty black fungus occasionally accompanied by a thick mass of white mycelia. As a general rule, air sampling for Stachybotrys yields unpredictable results mainly due to the fact that this fungus is usually accompanied by other fungi such as Aspergillus and Penicillium that normally are better aerosolized than Stachybotrys. Bulk or surface sampling of suspect materials can be analyzed in a laboratory for identification by light microscopy. This fungus is a slow grower on media, therefore does not compete well with other rapidly growing fungi. Colonies are powdery in texture, white, pink, orange or black in color. Is All Black Mold Toxic? Who is affected by mold? Molds are categorized in 3 different areas. Allergenic, Pathogenic, and Toxigenic. Allergenic mold types are the most common and found on most samples. 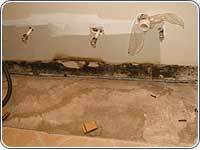 Molds are ubiquitous (everywhere) so there is no such thing as a mold free environment in homes. There are acceptable levels of mold in indoor environments that are always compared to an outdoor reference sample. These levels vary throughout the year and are usually lowest during the winter months and highest in the warmer, humid, summer months. There are 4 groups of people that more susceptible to the effects of mold. They are elderly, infants, immune suppressed and pregnant individuals. Mold can have an adverse effect on others as well. There is no rule as to what types of molds and how they can affect you and who is affected by them. There are currently no permissible exposure limits (PELS) to molds in the U.S. California EPA was close to establishing PELS in 2005, but was forced to back away since they could not establish something that was consistent with everyone. We have gone into homes and found that some occupants have some ill effects from molds and others are completely unaffected that are living in the same household. Most people have no reaction when exposed to molds. Allergic reactions, similar to common pollen or animal allergies, and irritation are the most common health effects for individuals sensitive to molds. Flu-like symptoms and skin rash may occur. Molds may also aggravate asthma. In rare cases, fungal infections from building-associated molds may occur in people with serious immune disease. Most symptoms are temporary and eliminated by correcting the mold problem. 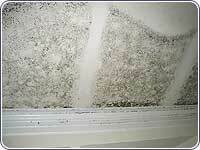 If you can see mold growth and/or smell a musty odor, you have a mold problem. 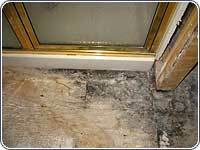 However, it is recommended that you do a thorough inspection to determine the source of the mold growth. Mold growth in an attic resulting from a leaky roof. Mold growth inside the framed wall resulting from a flooded basement.